Although otherwise completely disparate in content and tone, the classic movie Sunset Boulevard and USA network’s new Queen of the South open in markedly similar and risky fashion. The Billy Wilder-directed 1950 film began with William Holden narrating his demise as the camera caught struggling screenwriter Joe Gillis floating face-down in a pool. Then came the flashback to how it all began. 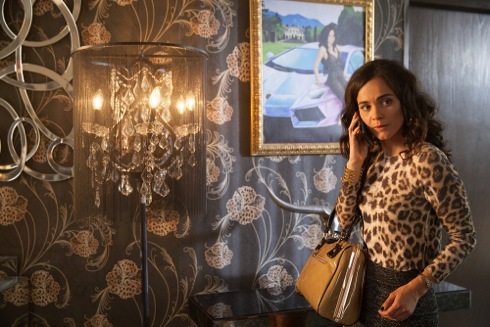 Queen of the South, which is both set and shot largely in Dallas, began with Alice Braga’s Teresa Mendoza introducing herself as a high-heeled and very well-heeled drug kingpin before being shot presumably dead in her palatial mansion. “In this business, your shelf life is only so long,” she narrated before a flashback to her poor girl origins in Sinaloa, Mexico. It can be dicey to kill off your lead character up-top and then expect an audience to play along with weekly prequels. But Queen of the South so far is clicking, with its first two episodes ranking high among Thursday’s top 100 cable attractions. The June 23rd premiere drew 1,389,000 viewers and had a .4 rating among advertiser-coveted 18-to-49-year-olds. Episode 2 held steady with 1,352,000 viewers while upping it’s 18-to-49-year-old rating to .5. Loosely adapted from the telenovela La Reina del Sur, the 13-episode Season One is in keeping with USA’s recent turn toward darker drama after going easier/breezier with the likes of Royal Pains, Psyche, Suits and White Collar. In contrast, Queen of the South is much more in the mold of USA’s acclaimed Mr. Robot, which returns for Season Two on July 13th. Teresa constantly fears for her life after the drug-running love of her life, El Guero (Jon-Michael Ecker), is murdered for dealing against the rules. Her pursuer is Don Epifanio Vargas (Joaquim de Almedia), who’s built his empire on illegal highs and now plans to become governor of Sinaloa. His strong-willed and bitter wife Dona Camila (Veronica Falcon), who wants nothing to do with politics, instead establishes herself in Dallas as a cutthroat drug empress with a stable of female “mules.” After various escapes -- all of them deftly filmed and staged -- Theresa eventually is caught and taken across the border to Dona Camila’s lair. But although brutal, it’s at least something of a safe haven from the vengeful Don Epifanio, whom Teresa had left for dead after one of her own brushes with death. Meanwhile, back in Mexico, Teresa is still trying to somehow extricate her best friend, Brenda (Justina Machado), who remains on the lam from the drug cartel. The strongest performance in the early going is from Falcon, whose steely, wily Dona Camila clearly will be a role model for what Teresa someday becomes. This is going to take a while, though. And Queen of the South, based on the first three episodes, knows how to dawdle a little without ever slowing to a crawl. The action scenes are gripping, the language can be rough within the expanding confines of ad-supported basic cable and the glimpses of the flesh are fairly bold at times. There are some lapses, though, including Episode 2’s unbelievably crazy/careening drive to Love Field by a Dona Camila underling who has Teresa in tow with a bellyful of fast-dissolving drug packets that must soon be expectorated. Cops can’t be expected to be everywhere, of course. But the entire Dallas PD must have been out to lunch for this one. Through it all, Teresa manages to gain a little empathy even while on the winding road to someday running “the biggest drug empire in the Western Hemisphere.” All she asks is that you not judge her too harshly.